Today it’s the Autumn Equinox, although autumn arrived here in the ‘shire a couple of weeks ago. We’ve been grateful for getting our first wood delivery in early; the fire has already been in use on the cold evenings as the nights draw in. It’s remarkable how quickly things change when they get going. It’s almost as if winter has attached a big bit of elastic to the sun, and while summer clings on as long as it can, eventually the strain gets too much and it snaps back. We’re in the penduluum stage right now, with cold nights and warm days, sudden showers and oddly hot, humid lunch breaks. The weather isn’t the only thing that’s changing. In some vague effort to tidy things up and make this blog slightly less disjointed*, I have started a new blog over at ravenbait.com. I will use that to focus on my writing, leaving this blog — my home on the internet for 15 years now — for all the random stuff that fills in the gaps§. I’m not a big one for cross-posting, although I’m not saying I never do it. I doubt I’ll take all the writing away from this site as it’s such a big part of my life, but I won’t be cluttering up the writing blog with Playstation posts, recipes, triathlon, wittering about adverts, complaining about Doctor Who (unless it’s a comment on specifics of the writing), gear reviews or odes to bicycles. And Stitch. 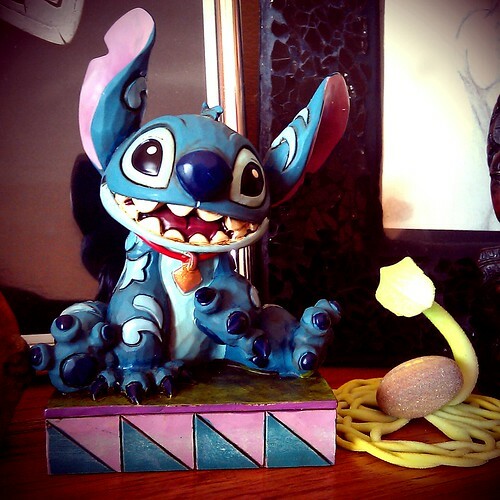 Mustn’t forget Stitch. If you come here for the velocipedes and the wittering, carry on as you were. You won’t notice much. If you come here to read what I think about writing, specifically my writing, then take yourself over to ravenbait.com where I’m slowly building up steam. * ‘Less disjointed’ is all relative, you understand. This is me we’re talking about. § And it’s a tight squeeze for a lot of it, I can assure you. Well, we’re sort of back, although most of the site content is missing, the posts between 2001 and June 2009 haven’t imported properly, my graphics directory has been given root permissions so I can’t do anything with it and I can’t seem to make hspace or vspace work on the avatars. But, you know, I can post and it’s not entirely awful. At some point I’ll get around to altering the background image to something I like, reinstating my blogroll, modifying the stylesheets etc etc etc (maybe even learning some php) but right now I have to get to the shop and back before Dr Who comes on. For those of you not following along in the social networking arena, my flash piece Big Brother, Little Sister made the top twenty in the Campaign For Real Fear. That was quite odd, as I was always in two minds about whether to enter or not. Writing has never been a problem for me, as some of you may know. Writing that other people would find intelligible is a different matter entirely. I tend to find that the pieces I write other people enjoy are the pieces I don’t like very much. For this particular piece I tried to write something with a narrative that other people could follow over the top of a different narrative that made me feel like it wasn’t missing something. Whether I succeeded or not I haven’t quite decided but obviously the competition’s organisers and judges, Maura McHugh and Christopher Fowler, liked what I produced. Thanks to them for picking my piece and also for staging the competition in the first place. All the winning entries will be published in Black Static and they will also be podcast by Action Audio. This is also going to be (probably) the last ever post I publish to the blog from blogger, as they remove ftp support tomorrow. I guess I’ll be installing WordPress this weekend. Except I’m racing in the Midlothian Tri, so it might have to wait. Until then you can find me on twitter, LJ, facebook, the Clubhouse — all the usual places. Look around here, you’ll find all the clues you need. I’m not hard to find. Incidentally, blogger has decided to withdraw ftp capacity for blogs. After ten years using the service I am being forced to leave, because I can’t just port my site across to blogspot the way google wants me to. As this will involve doing all sorts of weird stuff at the back end, and brushing up on my technical skills, it may be some time before sporadic blogging resumes. You may or may not care. I’m a bit narked with the incredibly short notice we have been given, and the assertion that only 0.5% of blogs will be affected so it doesn’t matter. It matters to me, and it matters to a number of other people who have been with blogger since the Pyra days, when ftp was the only method available; and who have designed their sites to be more than just a place to blog. So. That’s just the way it is and I guess it was about time for a redesign anyway. In honour of the latest tri photos and the approaching end of the season — I know it’s only August but the only race left on my calendar is Haddington (I refuse to do Aquathons or Duathlons) — I have created a new avatar for triathlon. The old static one taken from a photo in my first race season is/was rather passé. Three years of triathlon rendered into one handy avatar. This is the long version that LJ won’t let me have because LJ has a 40k limit.